Home / Nitrogen Articles / NASCAR Knows Nitrogen… In Tires! NASCAR Knows Nitrogen… In Tires! The 2015 NASCAR season is 10 races old and Kevin Harvick has established himself in strong position, winning 2 races and finishing top 10 in all but one outing. A talented driver, strong crew and fantastic engine program have helped propel the number 4 car to the front. But nothing works without a good tire technician. These often unsung heroes of the track manage where the rubber hits the road. At first glance, it doesn’t seem that a tire could make much of a difference. Every team, after all, uses the exact same tire. 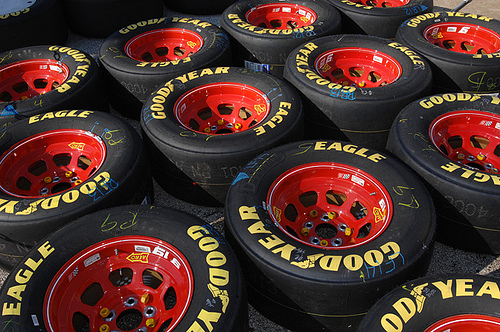 Since 1997 Goodyear has supplied each team in the top three NASCAR divisions with the Eagle One racing tire. That’s some 100,000 tires each season. But like Robert Duvall said in the NASCAR inspired classic Days of Thunder – “There’s nothing stock about a stock car”. So precise is the manufacture of each tire, Goodyear marks every one with a distinct barcode. A tire technician can scan the code and know the entire history of each tire. Where details this precise matter, something like the fluctuation of a few pounds of air pressure can make the difference between a tight ride that grips the track and a loose car without enough footing to hold in a corner. The major culprit of delta PSI in a tire is temperature, and the effect that increased heat has on the water vapor in compressed air. Just as the competition heats up in summer, so does the temperature on the track. The extreme heat experienced by a NASCAR tire, upwards of 200 degrees, causes the pressure in an air filled tire to fluctuate by as much as 10 psi. The solution for most tire technicians looking to reign in this pressure predicament is nitrogen. As a dry gas, nitrogen provides a much more stable option, greatly reducing pressure fluctuations during even the biggest temperature swings on the track. Success at the highest ranks of racing have propelled nitrogen use in commercial and even passenger vehicles. Where nitrogen can fall short is in ease of supply. A cylinder of compressed nitrogen, which needs to be replaced, is no match for an air compressor, ready to pump up tires whenever needed. So when a dealership or shop offers nitrogen filling, they are most likely producing their own N2 gas with a simple PSA (Pressure Swing Adsorption) or membrane based nitrogen gas generator. These plug and play systems remove oxygen, and moisture, from a supply of compressed air. Their low maintenance and easy to use design makes them ideal for a busy shop. Just like a NASCAR team doesn’t function without a team of experts, a company looking to use a nitrogen generator will benefit from speaking with an expert in the field. For more than a dozen years the team at Compressed Gas Technologies have been helping businesses get the most out of their nitrogen generation system. The next time you see your driver standing in victory lane, give a thought to the tire tech. There’s a lot riding on their work.